It was a pretty good week for the New York Islanders and right in the thick of it all was their captain, John Tavares, who was all alone atop of the weekly scoring standings for Week Eleven, finishing with 9 points in four games played. Tavares now becomes the first player in the hockey pool this season to finish with two Player of the Week nods, his first one coming back in Week Four. This also becomes his 6th all-time Player of the Week nod in the last 10 years of the hockey pool being online here, a fine achievement indeed. This week, Tavares started a brand new 4-game points streak, picking up a goal against the Capitals on Monday, a pair of assists against Dallas on Wednesday, a trio of assists against Columbus on Thursday and then a goal and a pair of assists against the Kings on Saturday. It was a busy, yet fruitful week for the soon-to-be-free agent captain. This brings the Islanders captain up to 19 goals and 40 points in his first 33 games this season, ranking him 7th overall in pool scoring, now 9 points back of the overall leader. Certainly, with all of the rushes on goaltending in the opening round of the draft, it should come as no surprise that Tavares fell down to the 2nd round, as Wilton snapped him up with the 34th overall selection. Now, with top 10 scoring numbers this season, Tavares has certainly emerged as one of the better bargain picks in the draft. There has been a lot of jockeying for position at the top of the standings and it almost seems like you need a Mover & Shaker type week, just to make it back to the top. Dale B. 's team accomplished that again in Week Eleven, taking the weekly distinction with a 34-point week and his team retook top spot in the standings by doing so. This is the second Newsletter of the season, where our reigning champ has finished atop of the standings and both times were Mover & Shaker weeks. He needed a big week come back from 4th place in the standings to jump back into top spot. 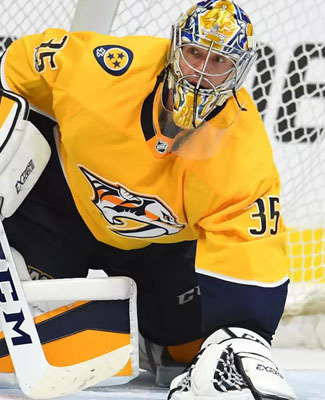 Pekka Rinne of the Predators was his top player in the week, finishing with 6 points, while seven more players on his team finished with 3 points each. That is some fine consistency through his lineup. Only one zero in his lineup this week and he has yet to receive a point from one of his Waiver Draft pickups, Los Angeles forward Trevor Lewis, who has played in six games since activation. Dale's biggest contributions are coming from the back end this season, as his team is currently tied for 1st in points among defensemen and is also 3rd in points from his goaltending, while his forwards are only just getting by, tied for 12th in the pool through Week Eleven. His team is also making the most out of some limited action, as it only ranks 18th in skater games played and 10th in goalie minutes played. He'll probably need to find some more skater games and goalie starts here soon, if he is going to want to maintain a position, not just in 1st place, but in the money, in general. Although the two pickups in the Waiver Draft has done some good for Ryan's team, the original players that were left from the October draft have not been producing the way they have been expected to in the last couple of weeks and it has kept his team hovering around 19th and 21st in the standings for the first couple weeks of the second segment and the Basement Dweller nod in Week Eleven has the teams behind him licking their chops. After 13-point week, the gap between his team and the group below has shrunk from 15 points to 8 points and if his team doesn't get their act together, some of those bottom teams may have improved enough at the Waiver Draft to leap frog his in the coming weeks. Flames forward Mark Jankowski and Blackhawks rookie forward Nick Schmaltz did what they could to keep him afloat, each finishing with 3 points a piece in the week, but seven active players with no points, including both goalies, were of no help to him. Statistically, Ryan's forwards are his Achilles heel, ranking last in the pool with only 131 points, something that his 6th place defense and 18th place goaltending can't quite save this year. The race for the trophy is good and close, as 1st to 3rd is only separated by 3 points, while 4th place is only 8 points back of top spot and 5th place is 12 points back. Dale B., Wilton and Jeremy are your current money spot holders, but Benson is still coming on, while Brian is slowly slipping away in the last couple of weeks. We're starting to see some larger gaps form between groups now, but one great week for a pool team, finding their way to a convincing Mover & Shaker could sort some of those issues out. We have had ourselves another elimination from the goalie survivor pool this week, as Mike's duo of Frederik Andersen in Toronto and Petr Mrazek in Detroit were unable to register a win in Week Eleven. Andersen's Leafs were hit hard by injury in the week, while Mrazek doesn't get much work anymore for the Red Wings, so it was seemingly on the cards, when Auston Matthews went down. This now leaves Grant, Jeremy and Wilton to duke it out for their money back. Both Jeremy and Wilton have five projected games for the coming week, while the Washington Capitals only play three games for Grant. Still a lot of opportunity, but anything can happen! It wasn't a great week in the plus/minus department, but overall, the whole pool was a combined +12, despite the best efforts of Brenda & Seward's team, which was -17 and dropped from being a plus team to a minus team in a blink of an eye. Three teams were tops in the weekly rating, as Dale B., Jeremy and Kristy & Don's team were all a +14 in Week Eleven, but none of those teams are currently in the top three overall, as Dale C. continues to lead everyone with a +50 rating through Week Eleven. There have been no real changes to the voting leaders for the All-Star Game captains, as Steven Stamkos of the Lightning, Alex Ovechkin of the Capitals, P.K. Subban of the Predators and Connor McDavid of the Oilers were still tops in their respective divisions through Wednesday's leaderboard update. Don't forget to cast your 10 votes per day for your hockey pool players, we don't want to let Derek B., Benson, Tony or Steve get away with the All-Star Game money, do we? Thanks to the 3-0 shutout that the Ottawa Senators handed the Montreal Canadiens in Saturday's NHL100 Classic outdoor game, Tony's team would have had a lead coming out of that game, if there was a mini-game to be had here. Tony has Craig Anderson, who led the way, making 28 saves for the 4-point performance. The only other pool teams to pick up a single point in this game were Stacey C., Dale B. and Brenda & Seward. Dale C. had three players play in this game, but no points to show for it. The only good statistics to come out of Week Eleven was the participation we saw, thanks to the Waiver Draft and a lot of returning players from injury. We were averaging 18 skater games per NHL contest, setting a new season-high in skater games played in the week with 919. We also saw a season-high in minutes played by our goaltenders, with 5,477 in the books. You would think with all of that ice-time, scoring would follow suit, right? Nope! We saw our 2nd-worst week in average scoring per NHL game, down at 11.24 points in 51 games on the schedule and we only collected 573 points. Our season-low average is 11.19 points, which is almost too close not to call the same. As if the injury situation in Vancouver couldn't get much worse, it did on Sunday night, as the Canucks not only got whooped on the scoreboard by the Flames, they also lost the services of rookie forward Brock Boeser, who blocked a shot off of his foot and had to leave the game in the 2nd period, not to return. There was still no update on Boeser's status on Monday morning, but he was seen leaving the arena on crutches, which isn't a good sign. This could be a huge loss for our current pool leader, Dale B., who was really enjoying some top end production from Boeser. If this is a long-term issue, we'll revisit it on the blog, but for now, I'm sure Dale will be keeping his fingers crossed for only a bruise or something minor. The blueline rotation continues to spin on Vegas' blueline and coming out of the lineup on Sunday night for the game against the Florida Panthers was Luca Sbisa. The official word on Sbisa is that it is a lower-body injury, which has kept him out of a few games already this season. In 23 appearances, Sbisa has 1 goal and 10 points for the Golden Knights, certainly a product of getting some regular ice-time with the expansion club. Steve's team has found some scoring since the activation of the Waiver Draft players, as his team did well in Week Eleven, finishing with 29 points, a season-high for his team, possibly signalling that good things are yet to come for his side. The San Jose Sharks are expecting to be without forward Logan Couture for tonight's game against the Oilers, as they have announced that he is dealing with some concussion symptoms, but they are still listing him as day-to-day for the time being. Couture is going through the league protocol for concussion symptoms, but the San Jose coaching staff appear to be somewhat optimistic that this isn't too serious. We'll see if anything more comes from this, like a placement on the Injured Reserve. There were some good gains from Tony's team in Week Eleven, so a loss of a scorer like Couture from his team to start Week Twelve is somewhat disheartening. Tony's team went up from 17th to 15th in the standings, thanks to a 31-point week, but Couture only had 1 point, so it might not be too bad, if everyone else keeps it up.